It was the picture perfect moment the world had been waiting for. Royal baby Prince George giggled, smiled and played his way through just his second public engagement – a trip to the zoo with his parents Prince William and Kate on Sunday. The trio arrived at Sydney’s Taronga Zoo to visit the bilby enclosure named after Prince George as part of Australia’s gift marking his birth on July 22 last year. It was just the fifth time the royal tot, who is almost nine months old, had been seen in public on this trip. Dressed in royal blue shorts and a striped, light blue shirt and blue shoes and socks, he appeared to wriggle mischievously in Kate’s arms as the family strolled to the bilby enclosure. At the enclosure, George met a bilby – also called George, then helped his parents unveil a plaque, renaming the enclosure the Prince George Bilby Exhibit. Bilby keeper Paul Davies said the royal couple were relaxed with George inside the enclosure. After the bilbies, George returned to Admiralty House and William and Kate viewed other animals at Taronga. They fed tree kangaroos, strolled past giraffes, enjoyed a bird show, and took in the rhino conservation display. The couple also heard about a number of Australia’s endangered species at the bird show – and appeared to take a keen interest. 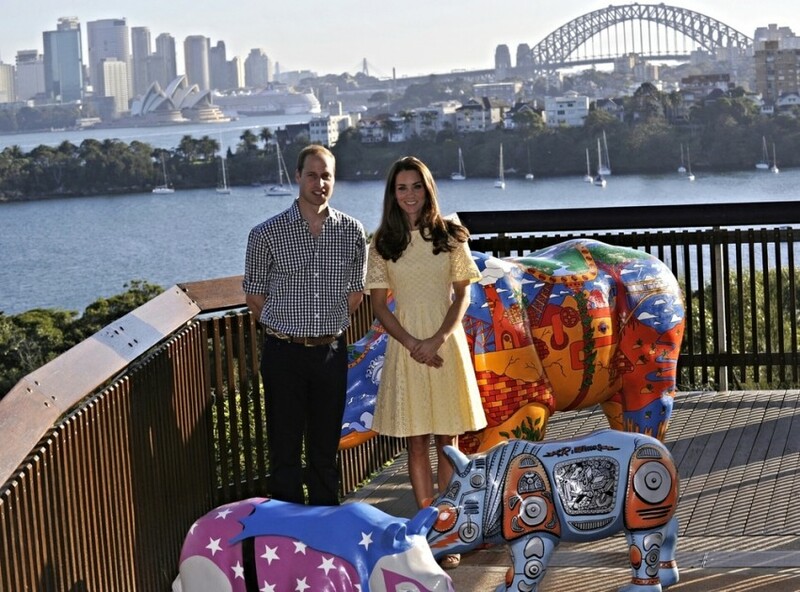 The duke and duchess finished their tour at the rhino conservation area and the Taronga Wild!, a mass public art exhibition and community conservation initiative raising awareness and support for Taronga’s black rhinoceros breeding program. They also met John Scanlon, secretary-general of the Convention on International Trade in Endangered Species of Wild Fauna and Flora. “The duke speaks passionately about his child – Prince George – having the opportunity to see these animals in the wild,” Mr Scanlon said afterwards. In February, William attended a high-level summit on the illegal wildlife trade in London alongside his father Prince Charles and brother Prince Harry to ensure the “survival of some of the world’s most treasured species” and set up his own initiative, a wildlife charity, United For Wildlife.